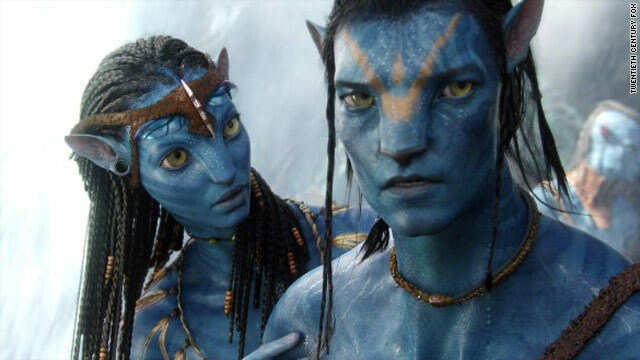 Two avatars from the hotly-anticipated new sci-fi 3D epic, "Avatar." Cameron had idea for movie more than a decade ago, last movie was "Titanic"
London, England (CNN) -- Hundreds of millions of dollars is a lot to spend on a film featuring a bunch of blue aliens -- but that's exactly what Fox Features has done with new 3D sci-fi "Avatar," which the movie studio says is the most expensive production it has ever made. In an interview with CNN just before the movie's worldwide release later this month, James Gianopulos, co-chairman and CEO of Fox Filmed Entertainment, wouldn't divulge the figure spent on the sci-fi blockbuster. Guessing the multi-million dollar sum of the latest film from director James Cameron has been a popular game for industry watchers for some months: a recent article in the Wall Street Journal speculated the film's final tally could exceed $300 million. "It is the most expensive film we've made, but now, having the luxury of hindsight, it is money well spent, so I'm not concerned about it," Gianopulos told CNN at the Thessaloniki film festival in Greece. Nevertheless, if some of the projected numbers are right, "Avatar's" budget would exceed the current most expensive film ever made. Currently, that crown is held by "Pirates of the Caribbean: At World's End," with a budget of an estimated $300 million, according to box office-tracking Web site boxofficemojo.com. But then Fox has been here before with Cameron. "Titanic" (1997), his previous feature, cost a record-breaking estimated $200 million at the time. Small wonder that Fox is investing hugely in the promotion and marketing of "Avatar," a technically-advanced epic sold as a game-changer for the movie industry, potentially ushering in a new era of mass 3D-movie watching. In August, director Cameron stoked the publicity, unveiling a 15-minute taster of the movie to sold-out audiences in selected cinemas around the world, an event dubbed "Avatar Day." Gianopulos says Cameron has had the film in his mind for more than a decade. "He first conceived the idea and the basic story and then had said many times over the years he was waiting for technology to catch up to allow him to do it the way he wanted to," Gianopulos told CNN. Set on the planet of Pandora, the story unfolds as a war rages between invading humans and the planet's native species, the Na'vi. Sam Worthington stars as a disabled former Marine who becomes an "avatar" -- a 10-foot-tall, blue-skinned creature genetically engineered to resemble the planet's humanoid life forms. Other cast members include Sigourney Weaver, who starred as Ripley in "Aliens," directed by Cameron more than two decades ago. Part of the multi-million dollar budget was the creation, by Cameron, of a new film camera that combines computer-generated imagery with live action. "He integrated it with a monitor system, which allowed him to see the virtual world he was shooting as part of the performance capture that he was doing," Gianopulos explains, adding that even he does not understand the complex cinematic process. Cameron's other big innovation has been to substantially reduced the size of the special cameras used to capture images in 3D, once the size of a large domestic fridge. These technical improvements allowed Cameron more fluidity in the production process allowing him to "construct the movie in the manner he thought creatively was best," according to Gianopulos. Asked how he balanced Cameron's creativity with financial concerns, Gianopulos said it was a matter of "having the confidence in the quality of the film and the scale of the film and the appeal of the film that you're going to make to say: 'Okay, it's worth the extra investment a film like this takes.'" Although Gianopulos admits that "Avatar" is Fox's most expensive film-making venture to date, he states that the final price is not that far removed from rival effects-heavy productions ("It's not far outside those parameters," he offers). "Movies of this scale which play to a huge global audience have become quite expensive because of the nature of the technologies involved," Gianopulos says. "But they also typically perform at the scale of that investment." Gianopulos says that more and more of the live-action films the company will be producing will be done in 3D as the technology expands further. "It's here now, and one of the things that 'Avatar' has done is encourage theatre owners to make the change over both to digital and to 3D capability," he says. "So now there are thousands of 3D screens all over the world." He says that at the moment, 3D is mainly the province of the biggest and best directors, including Cameron and Robert Zemeckis, who directed recent release "A Christmas Carol." Gianopulos predicts that over the years, audiences will simply come to expect 3D movies and that it will become the dominant form of film. "As Jim says, we experience the world in 3D, why should we experience film any different?" In the meantime, Fox should know in a few months if the hundreds of millions invested in "Avatar" was worth it. Or not. Eftehia Katsareas contributed to this report.